Breakfast burger. Yep. It’s a thing. Actually, it’s a truly magnificent thing. And reading about it simply doesn’t do it justice. Nowhere near. You gotta experience it. 1. In a small bowl, whisk together the mayonnaise, ketchup, mustard, salt, and pepper. Cover and refrigerate until you’re ready to assemble the burgers. 2. Line a rimmed baking sheet with parchment paper. In a medium bowl, use your hands to combine the beef, sausage, Worcestershire sauce, garlic powder, salt, and pepper. Gently shape the beef mixture into six 4-ounce (113-g) patties that are about 4 inches (10 cm) in diameter and place them on the prepared baking sheet. Cover and refrigerate at least 30 minutes. 3. Heat 1 tablespoon oil in a large cast-iron skillet or on a stovetop griddle on medium-high heat. Cook the burgers, 3 at a time, pressing with the back of a spatula, to your desired doneness—about 4 minutes per side for medium doneness—juicy, but cooked through. During the last minute of cooking, top each patty with a slice of cheese. Transfer the burgers to a plate. Add the remaining 1 tablespoon oil to the skillet or griddle and repeat with the remaining patties. At this point, feel free to enlist your significant other to do some egg frying for the topping process. 4. Spread both sides of the toasted buns with some of the sauce. (This sauce also serves as an excellent dipping sauce should you happen to whip up some sweet potato fries.) Place the cheeseburgers on the bottom halves of the buns. Top each with a fried egg, 2 pieces of bacon, a slice of tomato, lettuce, and the top bun. Get your fork and knife ready—you’ll need them. And napkins. Lotsa napkins. I hate being that gal who makes hyperbolic comments like, "Oh, my goodness, I cannot believe how good this is!" But seriously, these burgers are freaking amazing. I thought the ratio of beef to sausage was just right to make them taste rich and, well, like breakfast without making them overly greasy. The runny egg, bacon, and cheese come together in a gooey, melty mess. The sauce is so simple it hurts but complements every bit of this burger perfectly. I put the breakfast burgers on some lovely brioche buns that were certainly a lovely vessel for them. I'd be just as willing to serve these for brunch as for a backyard barbeque. I wouldn't change a thing! "Soooo good you could open a food truck based on this burger!" That was one of the comments I heard amongst the "mmmmms" and smiles when I served these delicious breakfast burgers. And best of all, they were easy to prepare and could be done mostly in advance. I premixed the beef, sausage, and spices in the morning. Then I cooked my bacon in the oven and mixed the sauce. At dinner time that night, I made the patties. The burgers cooked exactly as directed, about 4 minutes per side. However, to melt the cheese I did put a lid over the pans. I used 2 of my largest skillets and easily fit 3 patties in each with no crowding. While I was cooking the patties, my husband was preparing the eggs on our large griddle area. I can see if you have a small kitchen or are making these alone how you’d need to do these things in steps, but it really helped having him watch the eggs and assist with the assembly. The only thing I changed was I did not use a brioche bun, just standard burger buns. The burger patty itself was wonderfully seasoned and the combination of everything was just decadent. Definitely a recipe to remember when my college-age sons and their friends show up. It’s very filling. I couldn’t finish mine but everyone else did. 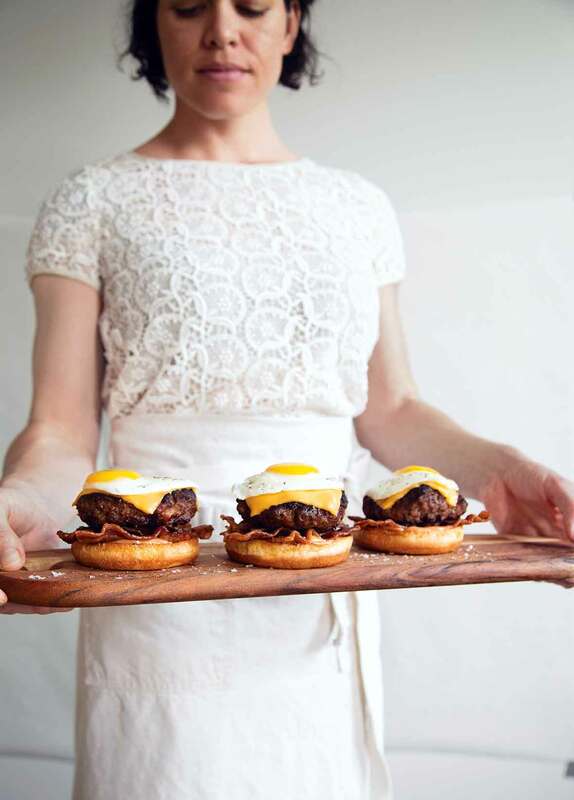 These breakfast burgers are truly an exercise in self-indulgence! How can you go wrong with a juicy, umami-packed patty snuggled under a blanket of cheese topped with a runny egg and resting on a little bed of crisp bacon? The sauce adds a tiny bit of acid and the veggies bring a contrasting crisp freshness to the protein party. All in all, these just might be the perfect hangover meal—just add a spicy Bloody Mary and you'll have all the bases covered! I initially thought that 2 tablespoons Worcestershire sauce might be too much, but it was just right! Added depth of flavor but didn't take over. Use a light hand mixing the meats and seasonings as there are no binders or fillers, so you don't want to compact the mixture. I let the mix rest 30 min while I put together the sauce, sliced the tomatoes and lettuce, and toasted the buns. And 4 minutes per side was the perfect cooking time—juicy but cooked through. These need a nice bun—lots of drippy elements need to be supported and soaked up. Very filling! I can't imagine many people eating more than one, unless you are feeding ravenous teenagers—then all bets are off. The burgers are so delicious you could talk yourself into wanting more, though! Dinner for breakfast is a fun idea, although these breakfast burgers also work as brunch, dunch, or a late-night dinner as well. If I was making this for 6 people, I might deputize one person as a helper so the egg frying can happen simultaneously with the burger, although one alert cook could handle it. The recipe easily scales down, which is handy since there are often just 2 of us, but the payoff for making the full burger and sausage mixture means we could prepare 6 burgers in advance, freezing 2 and saving 2 for the next day, all formed and ready to grill. The sauce can also be prepared ahead of time and, with a minor adjustment, becomes a spectacular dipping sauce should you happen to make some sweet potato fries. I think the sauce lacked a certain punch to not taste too mayonnaise-flabby and the quick fix was to stir in a tablespoon or two of chopped pickles. (I used bread and butter sweet pickles, but dill would work, and if you really are in a hangover-curing hurry, a spoonful of relish might work.) That changed the sauce and made it almost as good as a pricey “burger bomb” sauce or a $18 burger meal out at a restaurant. The meat mixture is a detail worth a little planning ahead—getting great flavor from grass-fed beef, ground coarsely, and really good sausage (I am lucky and have a great local butcher) made these really great burgers, and the simple amendments should be gently worked in. I used a 3-inch ring set up on wax paper on my scale, portioning 1/4 pound of the meat mixture and then, after removing that from the scale and ring, very gently patting it out to a 4-inch-diameter patty. For the first meal, I chilled these patties for 1 hour, the second overnight, and the last pair are in the freezer waiting for another meal. I used a really nice, sharp English Cheddar and it did not really melt in the pan, but since I quickly fried my eggs as I was removing the burgers, the heat of the egg helped soften the crumbly and tangy cheese. The bacon had been cooked ahead, and was at room temperature when I assembled each burger, which was getting a bit tall, so caution said to leave the lettuce and tomato on the side. Really that is fine—because this is absolutely going to be a knife and fork burger anyway! I didn’t have iceberg lettuce on hand, but half a handful of fresh mâche was perfect, along with 3/8-inch slices of Roma tomatoes. I had added a bit of the sauce to the toasted buns, passed more sauce on the side (which we added the chopped pickle to and preferred). On day 2, I prepared the burgers with a bit less carbohydrate (naked but decadent), sliced Jarlsberg, and added avocado in place of fried egg, then topped with crispy fried bacon, over a more generous plateful of mâche. Sauce on the side. I would say that while not as dramatic as the full suite with egg, the burger shines, and what the cheese change says is that a thin slice melts better but of course the more fatty and authentic Cheddar had more flavor. Hints that this was slightly more virtuous version must confess that it was very practical to drain away all but a smidgen of bacon fat and fry the burger in that (deliciously), and the many-hour fridge treatment made the burger less fragile. 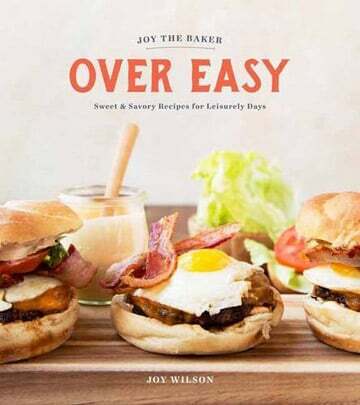 Breakfast Burger Recipe © 2017 Joy Wilson. Photo © 2017 Jon Melendez. All rights reserved. All recipes and photos used with permission of the publisher. This is an ideal father’s day recipe. while my father lives on the other side of the world, i will be thinking of him, too. Beautiful, Nhung. I love that so much. Thank you for sharing your beautiful sentiment with all of us! This reminds me of two things: 1) the one-eyed jack we’d have at midnight after working all day in the Navy when we were on deployment. very hearty. 2) in Hawaii we have the loco-moco, a gravy doused hamburger over rice……..